For styling specific cell types you can use the properties exposed by the RadCalendar control. When you wish to use more complex logic than the cell type for styling, you can change the appearance of a custom cell/cells through the CalendarCellStyleSelector and the CalendarCellStateSelector is used to change the default cell type. You can change the cell state in different views. 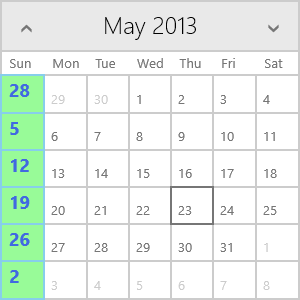 You can check the current view through the RadCalendar.DisplayMode property. Here it will be demonstrated how to define a custom cell state selector and apply it to specific cells. The example shows how to set the state of the dates divisible to 3 to blackout dates. First you will need a class inheriting the CalendarCellStateSelector class. You have to override the SelectStateCore method - the context parameter holds information about the current cell and using this information you can provide the logic for applying a state to this cell. Here it will be demonstrated how to define a custom cell state selector to specific cells only in YearView. The example shows how to set the state of the cells holding even months to blackout. Again you will need to create a class inheriting the CalendarCellStateSelector class and override the SelectStateCore method. This time you have to check the DisplayMode of the container. As you can see, only the cells in the YearView are set to blackout, whereas in MonthView all cells in a blackout month are normal. Here it will be demonstrated how to define a custom cell style selector and apply it to specific cells. The example shows how to set the style of the Sundays. 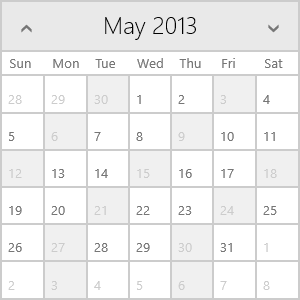 First you will need a class inheriting the CalendarCellStyleSelector class. You have to override the SelectStyleCore method - the context parameter holds information about the current cell and using this information you can provide the logic for applying a style to this cell.